Crappies are a popular North American game fish in the family of sunfish. They can be sought by recreational fishermen and women all year round, even in the winter time because crappies can be active in the cold, unlike bass which become lethargic. The meat of crappie is quite tasty and flaky for a freshwater fish. The biggest one I caught this spring was 3 pounds at 17-inches in length which is a really good size, though they can be as heavy as 5 pounds. I did release it, so that it could grow that big, someday. I illustrated the species in celebration of my cute crappie. The summer has begun. Happy Memorial Day all! When you are walking along a lake and you hear fish splashing, chances are that is the sound of Carp. In fact, Carp-type fish are more prevalent than you may realize. Did you know Koi fish are part of the Carp family, and so are pet goldfish? Carp fish forage on the bottom of the lake for algae, insects and snails. They are easily spooked by people or predators passing by on the shoreline. 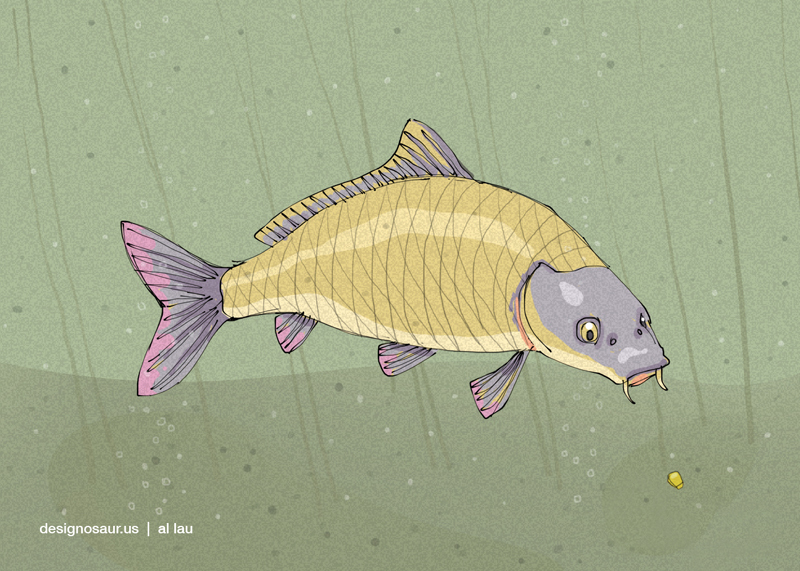 In my drawing of the carp, it encounters a piece of corn. I have no idea why carp love corn. Sweet tooth maybe?